This is Castle Nyon in Switzerland, the latest photo in our game of noticing differences in images. Nyon is in the canton of Vaud, and the castle has great views of Lake Geneva and Mont Blanc. 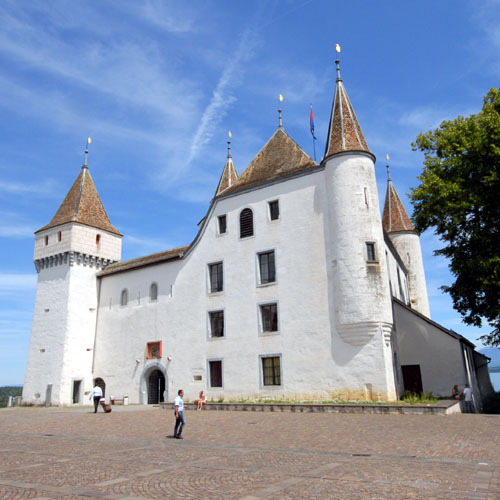 As well as being an historic building in its own right, Nyon Castle now houses a local history and porcelain museum. The present elegant, white building dates from the 16th century, and stands on a small rise, allowing panoramic views over the lake. The chateau was in use as a courthouse up till 1999, and visitors can view prison cells that were in use as recently as 1979. Entrance to the courtyard and terrace with views over the lake is free; there is a charge for the museum, which is closed on Mondays.